We’re so excited that one of our buildings made it to a Top Ten List in a widely distributed daily newspaper in NYC: AM NY! Sharing the list of “NYC’s Top Ten Ritziest, Glitziest Buildings” with New York by Gehry and The Plaza Hotel, 27 on 27th Street is a 27 story residential development with 232 units. 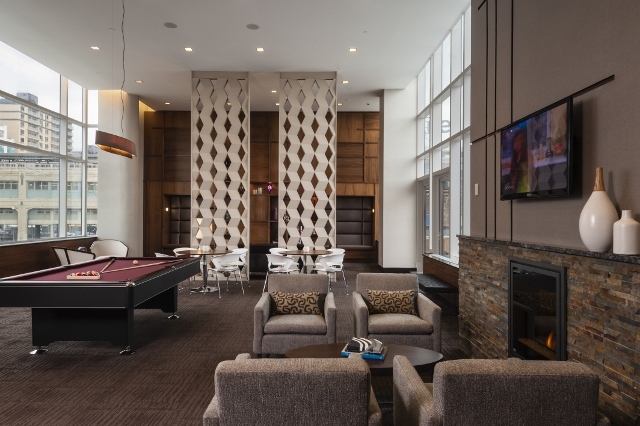 They are great apartments with some really nice finishes, but I think the reason the building made it on to the list is because of its exceptional amenity spaces. There is a movie theater (available for private screenings! ), a kids room, and a gym. I think the Lounge is also exceptional. 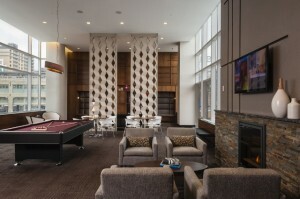 It has soaring ceilings and our goal was to create areas with intimate spaces within the larger recreation space. Small “reading” niches in a unique screened area serve to provide those intimate areas while others can party by the pool table and bar. Smart, but comfortable furnishings fill out the room to make it a main attraction. In-Site Interior Design spent two years working with the client, Heatherwood Communities, and architect, Karl Fischer Architect, during the development phase. We designed the full building interiors to appeal to those who might want to live in Manhattan, but not spend money on Manhattan rents. The rental units are spacious with 2 bedroom units offering additional kitchen/living storage units over the islands. It’s a great building and we invite you to join us in the celebration of our making a Top Ten!